We were less than whelmed the first time we saw Sister Act and an uncharacteristically charitable return visit to check whether we might not have been too hasty in casting the first stones proved equally unrewarding. You might think that that should be an end to it. And so did we. But there’s no prizes for guessing what dragged the Whingers back to the London Palladium. Yes, well done. 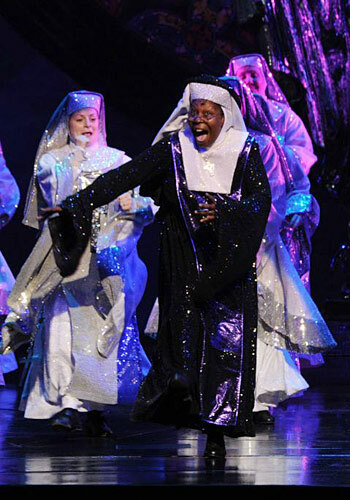 The original star of the film Sister Act and now “producer” of the stage musical Whoopi Goldberg takes over from Sheila Hancock in the role of Mother Superior. Well, we say producer, but it’s not in the way we understand the term. This clearly can’t be in the Sonia Friedman sense as we would have been asked to the party (albeit after much undignified begging on our part). But despite waiting for the glossy invitations to drop through our letter boxes or at least be delivered, wrapped in scruffy paper by mystery men to our hotel room in the middle of the night, we waited in vain. So the Whingers were forced to find their own way to see Sister Act with Whoopi Goldberg and without any dirty pebbles to rinse off as payment. In other words, the Whingers queued for day seats*. Oh the ignominy! But how could we not? A bizarre puff article for the show in the Evening Standard described Goldberg as “rashly offering herself” for the part and being “very, very, very, very, very nervous. Put it this way: I’m going to be wearing diapers”. So, with this being Miss Goldberg’s West End stage debut and there being the possibility that she might deliver more than just a performance onto the Palladium stage the Whingers just had to be there. It seemed that everyone else did too. How they all applauded and cheered as she walked on in her voluminous habit (allowing plenty of room to conceal her diaper) for her brief appearance at the start of the show, stopping it, perhaps wisely, before it had even started. How they went on and on, forcing her to put her fingers to her lips to stop the crowd going, er, whoopi, so she could deliver her few lines before disappearing into the wings leaving us to sit through the very dull first twenty minutes or so until she came on again. The enthusiasm spread like New Delhi-Metallo-1 and the rest of the cast were all applauded madly too which was just as well since most of the featured actors actually do get a chance to shine at some point and deserved the recognition – especially Ako Mitchell‘s Sweaty Eddie, Claire Greenway‘s Sister Mary Patrick, Jacqueline Clarke‘s boozing Sister Mary Lazarus and ex boy band Blue‘s Simon Webbe as the baddie Curtis. The lamest gags – and there are plenty of those littered throughout the show – drew guffaws from the pumped-up audience. So it was no surprise that even Whoopi’s big number, the dreadful, dreadful “Within These Walls” was greeted wildly. Let’s hope Sheila Hancock wasn’t in the house – particularly as the Evening Standard only managed to come up with “Sir Ben Kingsley, photographer Mario Testino and singer Mika” in its report of the evening. Ushers paced the aisles scanning the mob trying to spot people who might be trying to take photographs which was very distracting. But the house was in ebullient mood and even Sir Ben Kingsley looked cheerful. The Whoopi factor must be infectious. So what of Whoopi’s performance? Well, in once sense, of course, she is wasted. In another sense, she is completely mis-cast. but in the only sigificant sense it doesn’t matter – it’s Whoopi Goldberg! Singing and dancing on the stage of the London Palladium! Just feet away! And possibly involuntarily defecating. She got though it all gamely – even coping with losing her wimple during the fight scene. Whoopi’s approach to the role is wise: she plays the part of Whoopi Goldberg taking over a role in a non-sensical way for three weeks. This enables her to “be” Whoopi Goldberg” and that, after all, is why we were all there. It also, apparently, enables her to ad-lib which should make things very interesting once she has got into her stride. A third viewing of Sister Act did not lift any scales from the Whingers’ bespectacled eyes vis a vis the merits of this musical and Andrew was at his wits’ end at being forced into yet another visit. “They had better not do any more stunt casting, I don’t think I could sit through it again,” he whimpered. Phil was in agreement. Unless, of course they can persuade Maggie Smith to wimple up again. * Day seats at £25 “at the box office’s discretion” (Plus a booking fee! A booking fee when the tickets are bought direct from the box office? What’s all that about? That is actually and finally the THICK end of the wedge) and they’re no longer the front row, but restricted view seats which normally sell for only £30.75 (we think; they don’t seem to be advertised). This entry was posted on	Thursday 12 August 2010 at 9:02 am	and is filed under West End Whingers. I felt like I was really missing out when I went to the circus instead of seeing this but in retrospect I made the right decision. I work just down the road from the Palladium and assumed all those smiley people queuing up each morning would at least be rewarded with front-row day seats. Outrage! As for booking fees, I always find it interesting that the fee increases dramatically with the status of the actor / artist involved. Anyone would think they were fleecing people!! why go and see it again then? To see Whoopi Goldberg. Do try and keep up. Good to see my description of you is now your byline, I’d always presumed it was what you set out to be seen as (and let’s face it, many theatre blogs are just the same). I booked Sister Act as soon as it was announced Whoopi Goldberg was appearing for a treat for my Daughter and I £184 for two tickets. Only by accidentally cheking show times a week ago I found she decided not to do last nights show and next Mondays show. So many people were disappointed and there was no apology that she would not be appearing, but she was on the One show. Also two other main characters were understudies. Now I have to say Dolores understudy was fantastic and we enjoyed the show and if Whoopi didn’t care less about the fans then we dont care she didnt appear. I don’t even know how I ended up right here, but I thought this publish used to be great. I don’t understand who you are however certainly you are going to a famous blogger when you aren’t already. Cheers!